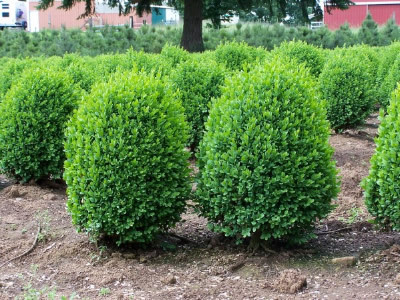 Boxwood shrubs are prized for their densely packed light-green leaves and rounded, compact growth habit. These hardy shrubs will reach 3-4 feet at maturity. Boxwood shrubs are medium-growing plants that are easily shaped by pruning -- a desirable characteristic for hedges and topiaries. Their roots are shallow, so a layer of mulch is needed to hold in moisture. Boxwoods will take full sun to partial shade, but planting them in a partially shaded area is preferable. Boxwoods are dense and become even more dense when you trim them. Easy maintenance is the key for boxwoods of all varieties. Little care is required once the boxwood has been established. Light pruning in the early winter is beneficial but not required. Boxwoods are extremely cold hardy, drought tolerant and disease resistant. Hardy in Zones 5-10. These shrubs are 6-12 inches tall and nicely branched. Shrubs will be shipped bare root with moist material around their roots.